Songimvelo Game Reserve is South Africa's largest provincial game reserve, covering an area of almost 50,000 ha, and is managed by Mpumalanga Parks Board. The reserve lies along the Eastern Drakensberg escarpment between Barberton and Badplaas. 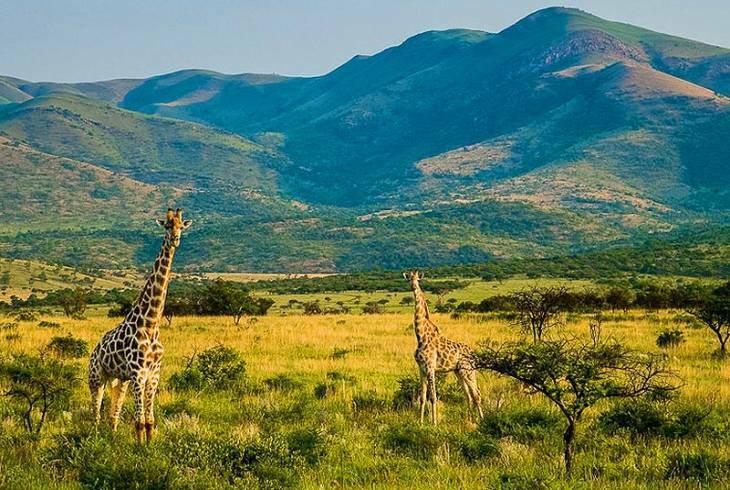 The Songimvelo Game Reserve is characterized by a diverse and magnificent landscape which consists of open plains, forested ravines and gorges, hidden valleys and rolling hills. The reserve lies within an area of high plant diversity, and includes an impressive total of almost 1,500 known plant species, including a number of more recently discovered varieties. Songimvelo is also home of the last wild population of Woolly Cycad. Due to the varying altitudes, climate, and geology, the reserve supports a wide diversity of bird and animal life. The grasslands within the reserve attract herds of game such as Burchell's Zebra, Blue Wildebeest, Red Hartebeest, Waterbuck and Blesbok, while other species such as giraffe, Impala and Kudu are more often sighted in the denser woodlands. Songimvelo is also home to a thriving community of White Rhinoceros. Buffalo are also seen from time to time in the reserve. Leopard, Blackbacked Jackal, and Brown hyena are also common , however these predators are nocturnal, and so they are seldom seen. Songimvelo provided habitat for 300 bird species, making it a popular destination for avid birders. Species at Songimvelo include such as African Finfoot, Broad-tailed Warbler, Southern White-bellied Korhaan, Red-billed Oxpecker, African Black Duck, Martial Eagle, Red-throated Wryneck, Sharp-billed Honeyguide and Croaking Cisticola. Within the upper reaches of the reserve, visitors can expect to see a variety of forest birds such as Knysna Lourie, Chorister and Starred Robins, and Orange Ground Thrush. Among the species to found on lower slopes are Goldenbreasted Bunting, Brubru Shrike, Plumcoloured Starling and Sheelly's Francolin. A selection of raptors such as Gymnogene, Martial Eagle and Brown Snake Eagle are also often seen soaring over the reserve. For visitors the Songimvelo game Reserve features a picturesque picnic site llocated alongside a smal stream. The picnic site is equipped with permanent braai facilities, running water and flush toilets. Also offered are guided game drives in 4x4 vehicles and interesting and informative hikes through the bush. Rustic accommodation and camp sites are also available at the Kromdraai camp in the eastern portion of the park . Songimvelo Game Reserve Information and Nearby Accommodation.